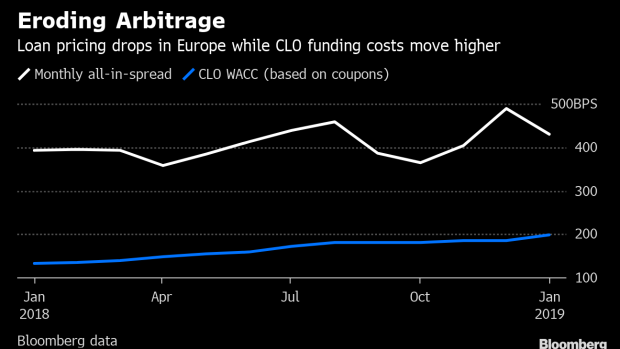 (Bloomberg) -- Collateralized loan obligations in Europe are facing the toughest conditions since early 2016 as they struggle with higher funding costs and a scarcity of loans. This could curtail issuance from these funds and curb demand for loan assets. CLOs account for around half the investor base for leveraged loans. A slowdown in CLO formation could force borrowers to pay higher spreads on their loans, ultimately bringing these funds back into the game by restoring the gap between what they must pay on their funding costs and what they earn in interest from their loan portfolio. But this self-correcting dynamic may take some time to feed through, with demand from other types of investors also dictating the pace of change. In the meantime CLO issuance may be arduous. Six new issues have priced this year, with another expected to price this week, pushing issuance ahead of that in the same period last year, according to data compiled by Bloomberg. But the current batch of CLOs reflects the need to clear the backlog rather than a healthy market. Despite a full pipeline of ramping warehouses the passage of deals to market could be arduous in the months ahead. The two main challenges facing CLO managers right now are more expensive liabilities and thin loan supply. Managers and arrangers are using all the tools in the box to get deals away. Even so, those in the market cite problems in selling some of the debt and equity tranches. Talk of some delayed syndications have also emerged. Stretched, or in some cases non-existent arbitrage, is the main concern for older warehouses. These were modeled to include loans with margins that simply pay too little to match the funding costs now required after an increase in CLO spreads. The cost of capital for CLOs has increased to well above 200 basis points from around 185 basis points in November. At the same time leveraged loan all-in spreads haven’t yet risen enough to compensate for the higher costs, eating away at the CLO vehicle’s equity returns, in some cases to the point where the deal no longer works. Loan volumes have been meager this year and mostly limited to add-ons of existing deals, rather than more desirable new M&A, while pricing has so far underwhelmed. A near-term pick up in launches offers the potential for some more choice, but over the medium term the loan pipeline doesn’t look promising. The scanty supply is problematic for managers of older deals looking to complete the ramp to deadline: without a pick up in primary issuance they will be forced to buy loans in the increasingly expensive secondary market. Reduced loan flow is also an issue for managers with newer warehouse facilities as they will also take longer to ramp, slowing down overall CLO formation over the near term. There could also be problems ahead for these warehouses unless loan pricing increases. That’s because some transactions are said to have been structured around model portfolios that include ’dummy assets’ priced at wider spreads than have so far been offered in the loan market this year. But based on current new issue pricing these managers may not achieve some of the identified target levels in new issue. Forecasts for CLO issuance are already down on last year, and the current state of affairs isn’t helping. But conditions can change quickly; a sustained increase in loan supply or more appetite from CLO investors could alter the market’s fortunes. And just as in 2016, any turnaround could lead to a pick up in CLO supply later in the year. --With assistance from Ruth McGavin.